Samuel R. Curtis rose to the rank of Major General in the Union army during the American Civil War. Placed in command of the Union Army of the Southwest, Curtis pursued and defeated the larger Confederate Army of the West in the Battle of Pea Ridge during two days in March 1862. In the fall of 1864 as commander of the Union Army of the Border, Curtis helped to defeat Confederate Major General Sterling Price's Army of Missouri in the Battle of Westport. Samuel Ryan Curtis was born in Champlain, New York. He attended the United States Military Academy and graduated in 1831. He resigned his commission in 1832. As a civilian Curtis gained engineering experience and served as an engineer for the city of St. Louis, Missouri. He also was a strong promoter of railroads. During the Mexican-American War, Curtis served as military governor of the Mexican towns of Matamoras, Camargo, Monterey, and Saltillo. Curtis represented Iowa in the US House of Representatives from 1857 to 1861. His railroad experience got him an appointment to the Congressional Select Committee on the Pacific Railroad. He was a Republican and supported Abraham Lincoln's election for President. He was in the middle of his third term when the American Civil War began. On June 1, 1861, Curtis received an appointment as Colonel in the Second Iowa Infantry. He was soon promoted to Brigadier General. For the rest of 1861, Curtis was in charge of the Jefferson Barracks in St. Louis, Missouri. On December 25, 1861, Curtis was made commander of the Union Army of the Southwest by Major General Henry W. Halleck. Curtis made his headquarters in Rolla, Missouri and took a series of actions in the winter of 1861 and 1862 to push Sterling Price's army out of Missouri. Curtis took his Army of the Southwest into Arkansas in pursuit of Price. Around the same time, Major General Earl Van Dorn, Commander of the Trans-Mississippi District for the Confederacy, had decided to move north and attack Curtis's army. Both armies engaged in Arkansas at the Battle of Pea Ridge. The result was a Union victory that secured Missouri for the Union. 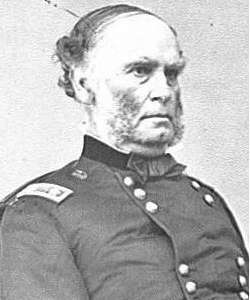 Curtis was promoted to Major General in March 1862. Curtis was reassigned to the Department of the Northwest in January 1865 and stayed there through the end of the war. Hess, Earl J., William L. Shea, William G. Piston, and Richard W. Hatcher. Wilson's Creek, Pea Ridge, and Prairie Grove: A Battlefield Guide, with a Section on Wire Road. Lincoln: Bison Books, 2006.